I love a bit of retail therapy and I love being rewarded just as much. To surpass the guilty feeling of losing all those hard earned pounds I like to make sure I’m taking full advantage of the various loyalty schemes. How would you feel if you could be rewarded for buying the latest mascara or perfume? Fantastic I bet! It’s actually a lot easier then you think and you’re probably already doing it. A lot of retailers want your business and they want you to return which is why they come up with loyalty schemes. You get 4 points for every £1 you spend in-store or online with frequent bonus point offers. Every 100 points equals £1.00 to redeem. The Advantage Card weekly email is very similar to its postal counterpart and offers deals and coupons to earn extra points. Boots Parenting Club and More Treats for Over 60s Club send out mail outs giving offers on relevant goods allowing you to earn extra points. The Parenting Club gives a extra 10 points for every £1 spent on baby products. Don’t forget the Extra Offer Kiosks that you’ll find in store. The kiosk is really easy to use, simply insert your Advantage Card and check out the offers available to you. Sometimes there will be vouchers available allowing you to earn extra points or discounts. One of the newest contenders on the loyalty card table, the Beautycard offers you one point for every £1 spent in-store and online. There are frequent bonus point offers and every 100 points equals £1 to redeem. You get three points for every £1 spent in-store and online over £25, or one point for every £1 otherwise with frequent bonus point offers. There are also the opportunity for free gifts and consultation appointments. If you shop through the Beauty club app there is the chance to grab 5 points for every £1. Every 100 points equals £1 to redeem. Be warned points expire if not used and you will lose everything that you’ve earnt. The House of Fraser card gives you 1 point for every £1 spent in-store and online with frequent bonus point offers. Twice a year they run Beauty Confidential where if you spend £50 within the allocated dates you’ll receive £10 off one of the stores top 30 must have products. Every 100 points equals £1 to redeem. One point for every £1 spent in-store or online. For every 100 points you’ll receive a £5 reward and a gift on your birthday. Simply pay £5 and you’ll get 10% off purchases for a year in-store and online. Collect stamps every time you make a purchase and receive a free product on your fourth and eighth stamps. It’s not a loyalty card but Mark and Spencers hold a two week beauty event twice a year where all the brands offer a gift with purchase. One of the oldest and well known loyalty cards on the block, the Nectar card has been around for a fair few years. Unfortunately their points per pound are dropping from 2 points to 1 in April but there’s still some good deals to be had. You can boost your point balance at BP, British Gas, Expedia, Homebase amongst others. From Wednesday 18 March 2015 there’s currently a deal available to double your point balance allowing you to get vouchers worth twice the value. For example £10 worth of points will get you a voucher worth £20 (valid up to £40). Each clubcard point is worth a penny if used for instore shopping and vouchers are sent out every 3 months if you’ve earned at least 150 points (£1.50). Clubcard boost allows you to get more for your money including a RAC membership for £18, an adult cinema ticket for £4.50 or a years Merlin theme park pass for £50. Head to Clubcard Deals for more information. Launched in October last year the Morrisons Match and More card combines its price match policy with a loyalty scheme. Morrisons compare the cost of your shopping to Tesco, Sainsburys, Asda, Lidl and Aldi and if you could have got it cheaper elsewhere they add points to your account. For every 10p difference you’ll get 100 points which will earn you a £5 voucher once you’ve reached 5000 points (easier then it may seem). You do need to spend a minimum of £15 however and at least one product needs to be eligible for the price match. you can boost your points through bonus offers and buying fuel. The Co-Operative membership card is a little different in that all the points you earn through shopping in The Co-Op are put towards shares. Your points will get converted into cash twice a year in June and November and the value of points is linked to the amount of profit The Co-Op made that year. Like movies? The Odeon Premiere Club may be worth joining if you’d like to be rewarded for watching your favourite films. You’ll earn 10 points for every £1 you spend and that can be put towards popcorn, sweets, snacks and even tickets. Not only do you get points you’ll also get the opportunity to participate in offers, discounts and competitions. Unfortunately the Odeon Club isn’t free to join but you do get points when you sign up.There are three memberships you can join, Classic for £1.99 which will earn you 100 points, Deluxe for £4.99 which will earn you 500 points and finally Ultimate at £9.99 which will earn you 1000 points, plus you get double points for the first month. You will also have to make sure you use up your points fairly quickly, as after a few months all points get deleted. Everyone loves a bit of Subway. The yummy sub sandwiches also offer a loyalty card which will earn you some free food over time. With a Subcard it’s important to register your card or you’ll only earn half the points. Unregistered cards earn 5 points for every £1 spent in the UK. Registered cards will earn 10 points for every £1 spent and only registered cards can redeem points. The point value of items varies with 200 points for a snack, 500 for a 6″ sub and 1000 points for a 12″ sub or flatbread. From 4 March 2015 the point scheme has changed and is now even more valuable! You’ll now earn 20 points for every £1 spent in-store. 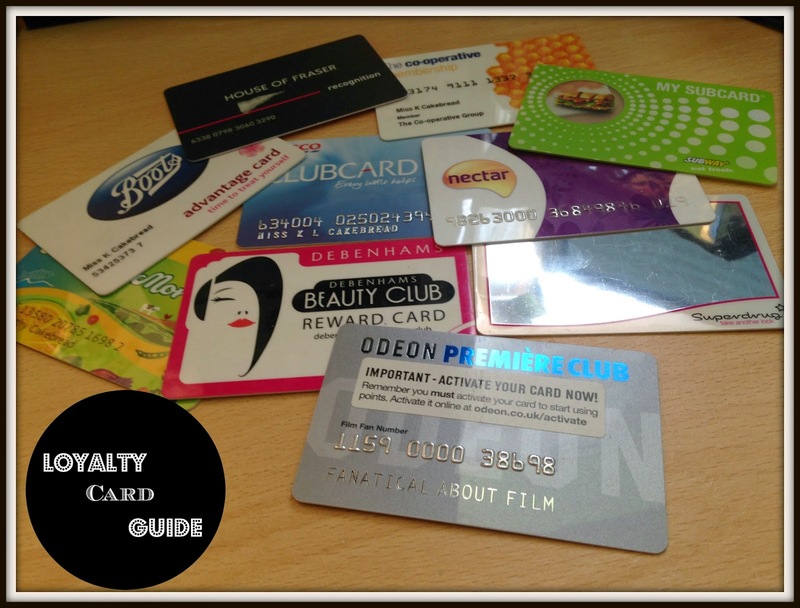 What do you think of loyalty schemes? Would you shop as much if you didn’t get rewarded for it? As always I love hearing your views!